A.M. Wilson's true passion in life has always been writing. After years of writing poetry and short stories, she has settled in the Twin Cities with her partner and two children to author popular romance novels. 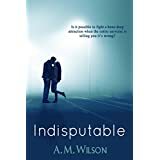 A.M. Wilson's debut novel, Indisputable, is a must-read among romance readers. Please enter your email address and click the Follow button to follow A.M. Wilson!